Why is Honduras reported to ICC? In an article in Tiempo yesterday, Reina RIvera Joya, from Centro de Investigación y Promoción de los Derechos Humanos (Ciprodeh), said that the president of the Supreme Court of Justice of Honduras, Jorge Rivera Avilez, and the Attorney General Luis Alberto Rubí Avila, have received communication from the International Criminal Court (ICC) about the state of their investigations. She went on to say that ICC has documented several cases of crimes against humanity, such as arbitrary detentions, torture, sexual violations of women, and politically motivated murders. The accused are, according to her, all the 15 justices of the Supreme Court of Justice including its president, the Attorney General of the republic, the leadership of the National Congress, the commanders of the armed forces, politicians, two directors of media companies, and various police chiefs. 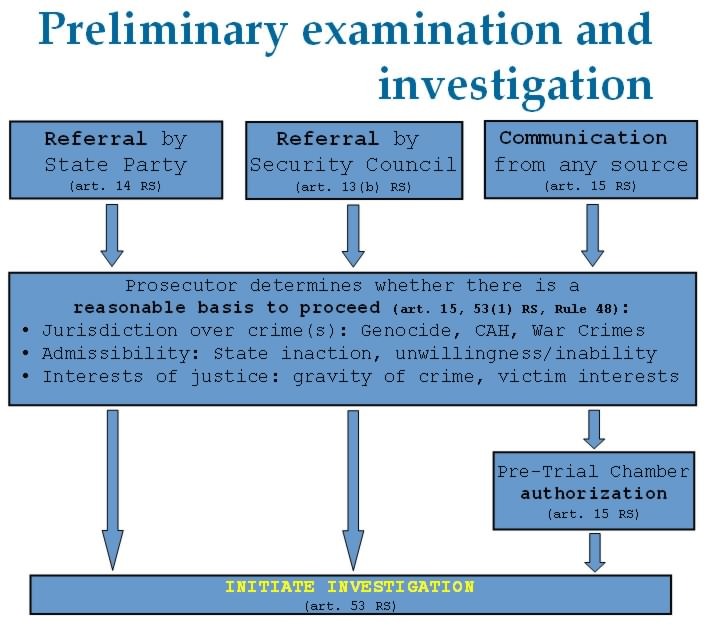 The prosecutor of ICC, Luis Moreno Ocampo, has allegedly informed Rivera Avilez and Rubí Avila in writing that investigations of their roles in the events of June 28, 2009, have been initiated. The case of Honduras is according to Rivera Joya in the stage of investigation, the next step being for it to be transferred to the department of documentation. “The International Criminal Court will wait for a prudent amount of time for the national justice to act, but if it senses that there is a tendency to avoid responsibility for those involved, then the ICC will continue,” she said. What dow this mean? The graph below illustrates the process (click for larger view). As you see, there are three kinds of criteria for determining a reasonable basis to proceed. From the statements of Rivera Joya, it would seem like ICC has determined that the first criterion has been met (arbitrary detentions, torture, etc). They may also have determined that the third criterion has been met, but it seems that the second criterion has not yet been met. However, there is a second aspect. The list of suspects that Rivera Joya listed would have been appropriate if there had been a coup d’état in Honduras; and if so, then the second criterion would automatically have been fulfilled. 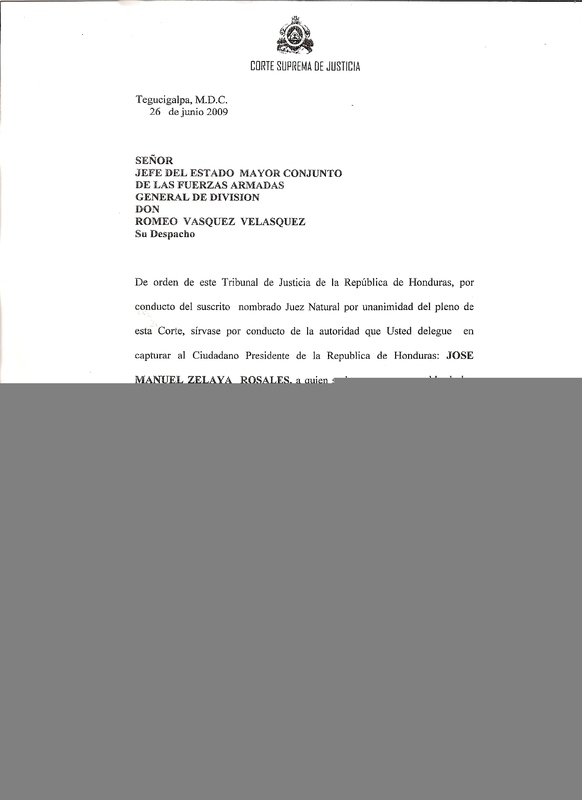 The mention of a letter from the prosecutor to Supreme Court president Rivera Avilez, and Attorney General Rubí Avila, suggests that ICC is looking into the legality of the change of president in Honduras on June 28th, 2009. First, he is evaluating if there was a coup d’état in Honduras. If so, ICC will presumably continue with a preliminary investigation immediately. If not, ICC will surely wait to see if Honduras’ own judicial system investigates and prosecutes the alleged crimes. If the legal system of Honduras operates as intended, the ICC will not intervene in any way. If any additional information comes from ICC, I will add a note here. My personal prediction is that ICC will find that there was no coup, meaning that unless the judicial system in Honduras messes up, they have nothing to fear.